"Suppose we had no police force, good or bad. Suppose we had...just silence. Nobody to listen. Nobody to answer. The battle's finished. The jungle wins. The predatory beasts take over." Stemming from the expressive lighting, oblique angles and edgy material of the German expressionist film, film noir has made quite an impression on cinema, captured by Warner Bros.' first volume in their Film Noir Classic Collection. This is a genre filled with masterful capers and many misfires. Within such a shadow-drenched environment, it's easy to get lost in the style of noir and to forget about the stories and characters that wade through the corruption. Thankfully, John Huston's The Asphalt Jungle does not fall head-first into this trap. Certainly a far cry from MGM's (the film's original studio) sterling reputation for family films and musicals, this gritty crime caper is one of the original, often copied heist pictures. The score: a host of diamonds and precious jewels at Belletier's. The architect: Doc Riedenschneider (Sam Joffe), just out of prison. Seven years behind bars gives a man time to think, and the German (bet you thought he was Swedish) doc has conceived of the perfect plan—all he needs is funding. In steps prominent lawyer Mr. Emmerich (Louis Calhern), whom Doc meets through Cobby (Marc Lawrence), a nervous, frequently sweaty man whose criminal pursuits afford him a life of modest luxury, but at the cost of his blood pressure. Emmerich is at first reluctant, but this is only a guise; he is secretly bankrupt, caring for a sick wife and a young, fetching mistress Angela (Marilyn Monroe, in a small role that lights up the screen). Doc is a patient man, seemingly in control at all times and in all places. Any obstacles that are thrown in his way are thoughtfully considered and overcome with an attitude of clairvoyance. 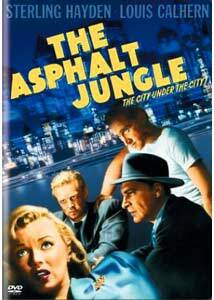 Now with the backing, he needs a crew: Gus (James Whitmore), a hunchback, is the best driver around; Louis (Anthony Caruso) can crack any safe, and prefers "soup" (a delicately handled little bottle of nitro) to other explosive means; of course, a hooligan is needed and Sterling Hayden plays Dix, a seemingly simple crook, but with decidedly personal issues. All of his crimes are bent to right a wrong, a lost bet that cost him everything. Every penny he steals goes toward the same racket, hoping to score big and erase the pain of his past. Hanging on his every word is Doll (Jean Hagen), a down-and-out woman who is loyal to the end, though Dix may never notice. Emotional and physical baggage in hand, the caper goes down, and not without its share of difficulties. Once the loot is acquired, the party has only begun. Chance occurrences, double-crosses, a corrupt cop, Doll's affinity for Dix, Angela's affinity for Emmerich, and Doc's affinity for the pleasures of life take their toll. Consequently, it is the characters' vices that lead to the eventual outcome. Crime's cost is made chillingly clear in a gray, shadowy jungle, and later, a sunlit horse ranch. John Huston, known for his famous quest films (The Maltese Falcon, The Treasure of the Sierra Madre) made his mark with this highly regarded, classic noir. All the trademarks are here, including impressive, high-contrast photography, dark, vacant city locations, loads of fedoras and trenchcoats and a few "heaters." The script is pretty much your standard heist fare, but manages to elevate itself above the usual crime picture with plot elements that go deeper than the scheme at hand, and a cast colorful characters. Sterling Hayden starts out appearing rather stiff, but that's his persona: uncompromising, somewhat simple-minded, yet grappling with large issues. Sam Joffe's Doc is effectively calculating and cold, yet with a subversive sense of decency�an odd combination. Louis Calhern, as Mr. Emmerich, is the typical socialite whose respectable image is always teetering on the edge of a blade. Monroe and Jean Hagen are the requisite, memorable sexbombs, but are given very little to work with. All these elements combine to create a palpable feeling of dirt. This is a scummy city, full of savages and disillusionment, at least within the "city under the city." This brutality does not go unchecked, though, for a clear message is sent to its audience in the final, gripping frames. Image Transfer Review: Warner's transfer is simply breathtaking. This is a luminous black-and-white image, bursting with fine detail, good contrast, and rock solid blacks (especially important here). There is some film grain and the occasional fleck of damage to deal with, but these are very minor gripes. Overall, beautifully done. Audio Transfer Review: The English monaural audio is understandably thin, but exhibits clear dialogue and sound effects. The film is oddly devoid of music, but it manages to help convey the eerily quiet urban landscape. Hiss is next to non-existent. Extras Review: Warner has managed to compile a couple of quality extras with this value-priced release. A fine primer to the film can be found in an Introduction by John Huston (00m:50s), seemingly derived from an old promo made around the film's production year. A young Huston touts the seedy nature of the urban jungle's cast of characters. Next is a commentary by author/film noir specialist Drew Casper, paired with some interview excerpts by James Whitmore (introduced by Casper). A professor at USC, Casper gives great insight into Huston's canon, the unconventional nature of this picture and the Hollywood environment in which it was produced. Clearly, his knowledge of this period is absolute. The film's theatrical trailer is also included. John Huston's jungle is full of shadow, crime and character—things that make noir worth viewing. Certainly a classic in the genre, its script manages to bring what could have been a standard heist picture to a new level (but doesn't stray far). Warner's polished disc captures the grimy setting. Well worth picking up; just make sure you pay for it like a good citizen.